You guys know I love pickles, right? Yup, even after working two summers at Steinfeld’s Pickle Plant when I was a teenager, I still love pickles! 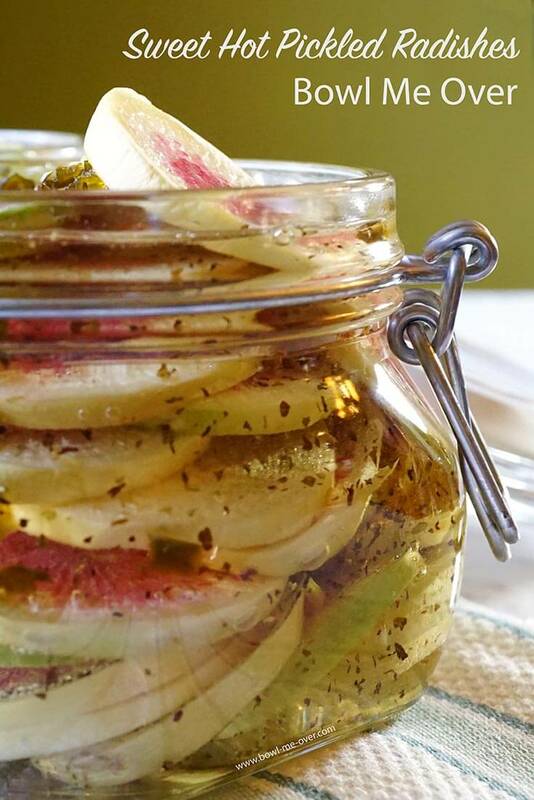 What I love even more is that pickled radishes are easy AND they are completely delicious! I shared this recipe last month with Jenny’s readers on The Melrose Family and now… I get to share it with you! As I said, I am a big lover of all things pickled like Refrigerator Pickles and Pickled Peppers. I’ve worked pickles into the recipe for Red Rice Thai Wrap (amazing!) and a fabulous recipe Cuban Sliders – what can I say I love pickles! Never made pickles before? That’s ok you can do this. These are refrigerator pickles. So all you need to do is cut up the veggies, boil the pickling liquid, pour it over everything and tuck it in the refrigerator. The fridge does all the work for you, love that!! So check out the picture below – these are watermelon radishes also known as Chinese radishes. They taste just like a regular radish, but they are super pretty aren’t they? These are watermelon radishes also known as Chinese radishes. I fell in love with these little gems when we were visiting our friends Ron & Michelle in New Mexico last fall. Watermelon radishes (approximately named!) are slightly spicy and run a little larger in size than your standard radish. They are bright, crunchy and delicious! I think they are gorgeous and believe it or not, these pictures have not been enhanced – these radishes have AMAZING color! If you plant a garden this spring, consider planting these little delicious gems! Just look for seeds for watermelon or Chinese radishes at your local garden store. Watermelon radishes are slightly spicy and super crunchy – really yummy! To get started, the first step is thinly slicing the radishes – no fancy radishes? No problem, use regular radishes, carrots or cucumbers – you can use almost any type of root vegetable! Slice the radishes and pile them into a jar, packing the jar tightly. I don’t use a fancy mandolin to slice the vegetables. Just a knife – here’s something to keep in mind – the thiner you slice the vegetable the softer the pickle will be. If you enjoy a crunchy pickle, slice them thick. Step two is combining the pickling liquid – sugar, vinegar, water, garlic & jalapeños into a pan, bringing to a boil, simmering and then allowing it to cool. Next you’ll pour it over the radishes. After the pickling liquid is cool, pour it over the radishes, filling the jar to the top. You don’t have to have a fancy jar either – any old glass jar will work as long as you are able to fit the veggies in and close it tightly. Fill the jars with the liquid to the top covering the radishes. Seal the jars tightly and let your refrigerator do the rest of the work! Then into the refrigerator they go. Technically I try to wait for a week, but I’m usually digging into the jar by the next day! The recipe below will make two jars, however when I make pickles, whether it’s this recipe or one of the other recipes I’ve mention I usually double it. They keep in the refrigerator for months and are always a great snack! Delicious? Yes, sweet – absolutely! Spicy with just a hint of heat. Homemade pickles are easy too! These pickles amazing! Perfect to on a burger, beautiful side dish on your buffet and a yummy snack too. 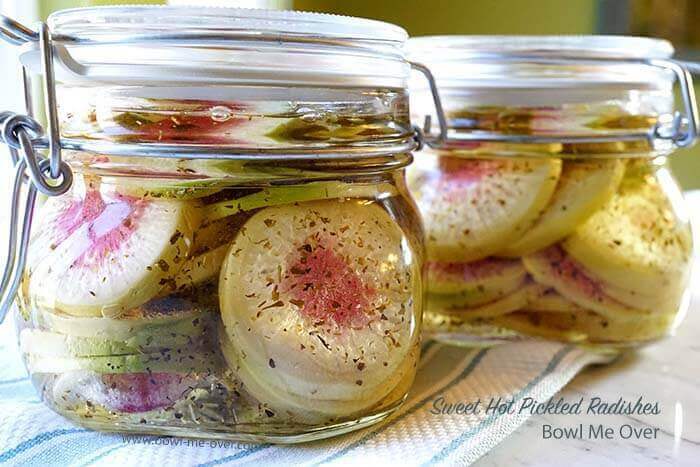 Sweet Hot Pickled Radishes - homemade pickles are easy & delicious. Tons of flavor a great snack, yummy on a burger! Start by cleaning the jars well. Invert and allow to dry completely. Next prepare the jalapeños pepper. Remove and discard the seeds and veins of the pepper (if you're concerned about too much heat if you're not, leave them in! ), chop finely. Mince the garlic. Clean the radishes, remove the root and greens. Slice thinly. Pack into jars. You'll want to pack the radishes tightly into the jars because as they begin to pickle they will shrink so pack them as tightly as possible. Pour the cooled liquid into the jars. Seal tightly and refrigerate. I try and wait 1 week before using, but after 24 hours, the pickles begin to get sweet and spicy! This sounds so delicious. 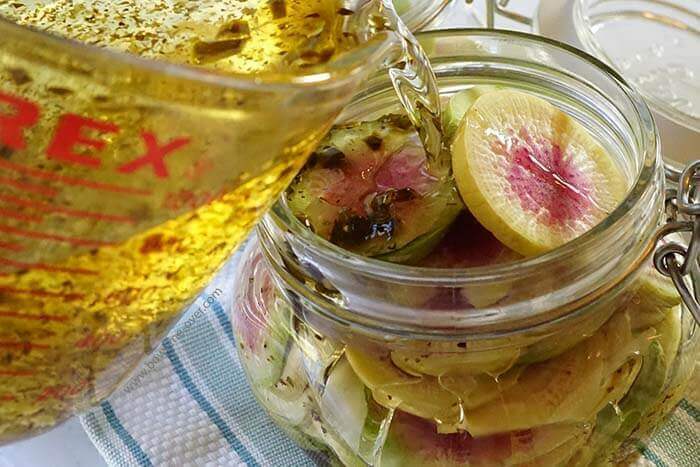 I am a huge fan of pickling anything and I am definitely using your recipe to pickle radishes. That is awesome, enjoy Rini! I just so love anything pickled too, yum, yum, yum!! I had some in the fridge when you were here I should have got them out!! I love making pickles (and chutneys and jams and all kinds of preserves)! So satisfying. Loving how cute these watermelon radishes look! Me too and I agree so satisfying to make your own preserves – thank you Kavey!! How fun is this?! These would be such a fun little snack or treat for my next spread. I cannot wait to try this. Thanks for sharing! Luci’s Morsels | fashion. food. frivolity. They would be perfect for an antipasto spread!! Please give this recipe a try!! The radishes are so beautiful! I love to pickle my own vegetables! Wonderful! Here’s another recipe to enjoy Catherine!! I have these two jars of pickled fruits in my refrigerator right now and I love to have bite on and off.This looks so good,I will definitely try! I know, just so a yummy little bite! Please let me know what you think of the recipe Prasanna!! 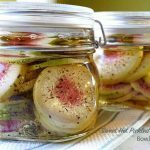 I LOVE pickled radishes, but ever had these ones pickled or otherwise – they are so pretty! 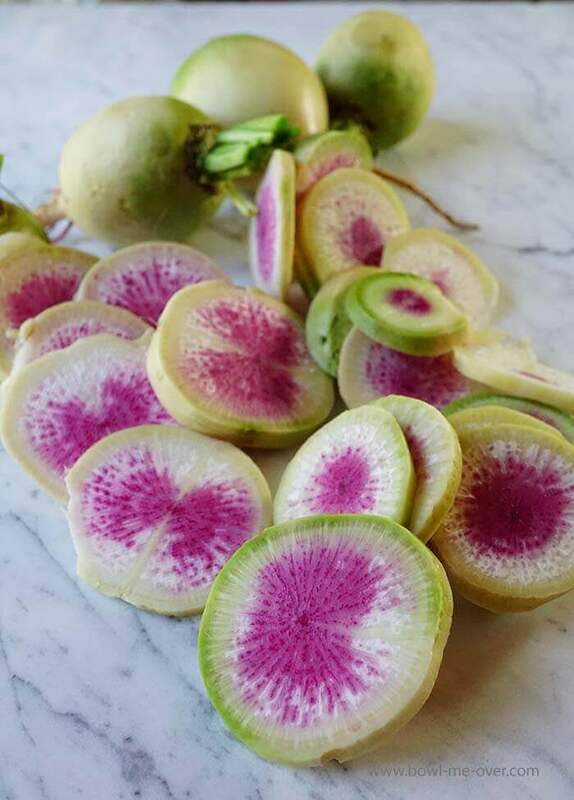 Watermelon radishes are so pretty, just love their color – thanks Jane!! I only have the smaller radishes to hand but would love to try pickling them too. Smaller radishes would work great, definitely give them a try Bintu! Oooooo I know lots of people who would adore these! I’ll have to share the recipe with them too! Fantastic! I hope they enjoy them Cliona, thanks for stopping by! Looks like there is some sort of herb/seasoning in the jars in the picture? Hey Stacy – what looks like herbs is the garlic & jalapeños. They darken a bit while cooking. The color of these are beautiful! I love seeing radishes, onions, and other colorful items get pickled because they really do a great job at brightening up plates of food. Thank you so much for your recipe! Can’t wait to try it at home.